When most gamers think of the East Front in WW2, it usually revolves around games starting with Operation Barbarossa, the drive on Stalingrad in ’42, Kursk, or at the tactical level where the year the battle is occurring is mostly secondary to the game. Rarely, if ever do you get games about the 1944-45 period and even fewer for 1945. Most of these involve either the Russian steamroller in ’44 that destroys Army Group Center or the battle for Berlin at the end of the war. Into this little gamed arena comes Konigsberg: The Soviet Attack on East Prussia, 1945 from Revolution Games. The game focuses on the drive by the 2nd and 3rd Belorussian fronts in January of 1945 to cut off the German units in this area as well as seizing several cities along the coast, including Konigsberg. Having recently read the excellent Battleground Prussia: The Assault on Germany’s Eastern Front 1944-45 by Prit Buttar as well as being like a moth to the flame when it comes to East Front games, I was intrigued by the subject. Even before the game arrived I was wondering how they would simulate the German command issues, the Russian breakthroughs, manpower shortages on both sides, etc. The historical situation for both sides was full of obstacles, from the Germans trying to form a defense with scattered units, limited armor formations for counterattacks, etc., to the Russians sometimes getting too far ahead of themselves, the best Russian units being assigned in other sectors, and the unpredictability of the Germans at this stage of the war where some units might fade away at first contact to others fighting to the last man. I was fearing a sizeable rulebook with a ton of chrome in an attempt to simulate this forgotten theater with all sorts of rules for dealing with weird situations, so I was actually relieved when the game arrived to see that the rules are actually pretty easy to digest and the game is pretty streamlined. My game arrived in a Ziploc bag and as I looked over the complete package it was pretty good for a company whose games I had never tried before. The 22 x 34 map covers the area of East Prussia around Konigsberg and Elbing, two critical objectives for the Russians in early 1945. 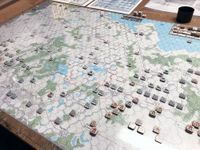 The cities, towns, defense lines, etc., are clearly marked on the map, with holding boxes for aircraft, volksstrum units, Grossdeutshcland units when the formation withdraws, and activation tracks for the three major formations in the game. Probably not one of the all-time great maps in gaming history, but this offering from long time game designer Joe Youst is pretty good. The 280 counters are double sided and color coded for the various formations, which greatly aided set up and play. The counters are functional and minimalist, but they work well. If there was a fault of the components it would be in terms of play aids. The back side of the game cover has some, there is a combat results table on the map, the random events are on the back of the rules, there are no set up cards, and so on. Yes, this is not an $80 boxed game, but the gamers who want to play this could have used all of these things in one place or on a series of play aids. The positive side is that it does not detract from the play of the game and there are some files here on BGG that will help. If you have ever played MMP’s A Victory Lost or A Victory Denied, then you can pretty much set up the game and get started! Konigsberg basically uses the same system as those games with a few tweaks here and there, but if you have any experience with those games it takes little effort to play this game. If you’re a fan of the SCS series then this will also be a quick transition for you and also for most gamers who are familiar with many traditional hex and counter games. Basically, each turn players draw chits for the various formations, then move and attack with those units. The game features a +2 movement point penalty to enter and/or exit a ZOC, so units don’t do a lot of moving each turn as most have a movement allowance of four for infantry and eight for mech units. Each formation has an HQ unit and can command all units of its formation color usually out to a range of 4-6 hexes, plus a few independent units that are not colored. Combat is also fairly standard with an odds-based CRT and column shifts for air support, terrain, etc. Results are usually a combination of retreating and step losses, but terrain such as defense lines, cities, etc., can negate some retreat and step loss results. What drives the game however, is the chit pull system and it is a bit different from AVL and AVD. For starters, ALL of the formation chits are put into the cup unlike the other games where you are limited in how many can be placed in the cup each turn. Here it is the exact opposite in that all of the formation chits are in the cup, but you are allowed a specific number to be pulled each turn. For example, in a turn the Germans may have an activation level of four, the 2nd Belorussian Front six, and the 3rd Belorussian Front four. Sounds great until you realize there are 20+ chits in the cup at times! Yes, this means (particularly for the Germans) that few of your units are going to move each turn. The trick is using the formations that can move to achieve your objectives each turn, whether that is reforming the front if you’re German or setting up a breakthrough if you’re Russian. Add in a random event chit, Russian barrage chits, etc., and you have quite the amount of chaos, which surprisingly represents the historical situation pretty well. The Germans often get chits that they don’t need and the Russians can never seem to pull the right combination to exploit a huge gap sitting right in front of them. Both sides must use the formation chits that they do get to set things up for later turns or additional opportunities when they present themselves. 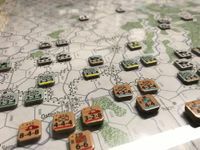 There are several chits for both sides that will activate units of any formation, which can certainly help in plugging gaps if you are the Germans or hammering a defense line that’s about to crack if you’re the Russians. As with many East Front games there is chrome here, but fortunately it is very easy to incorporate, although a reference card with some of the items would have been helpful. There is a random event chit, 7th Panzer which had no units of its own, but can command other independent units, the Admiral Hipper for fire support, Volksstrum units that can be moved each turn to garrison vital locations, and much more. One of the more interesting rules regards the available air units, which can be used for a two column shift, but then they take an additional turn to return, or for a one column shift and they come back next turn. This does give both sides some interesting options in regards to using their available airpower. Both Russian fronts have barrage chits which are useful in forcing defenders out of strong positions, Grossdeutshcland’s units get withdrawn, then hopefully return later, and many other small, but interesting aspects to the historical campaign have been added into what is a surprisingly short rulebook. The game begins with the Germans in various defense lines around the map with quite a few units scattered in the rear areas. 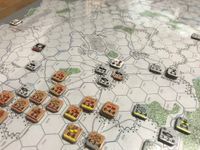 The first moves by the Russians will be to punch a hole somewhere in those lines and race through the gap to get to the victory point hexes in the German rear area. This is much easier to do in the 2nd Belorussian sector than in the 3rd’s due to the terrain on the eastern side of the map as well as the starting positions. In fact, during my plays the 3rd Belorussian front had some success, but never could really break out. The Germans needs to use their activations to fill in holes, pull units back to the next defense line, and transfer units to the threatened sectors as quickly as possible. It sounds easy, but the chit pull is chaotic (for both sides) and at some point, the defense will crack. Once that happens the Russians need a string of chits to push through and seize the VP hexes before the end of the game. What sounds so simple for both sides is actually challenging to accomplish. Several chit draws of formations that aren’t really going anywhere can doom your turn and possibly the game. Pros: If you like the AVL series of games then this is something that you’re going to enjoy, as well as those gamers who love chaotic situations. Not knowing what is coming out of the chit cup next certainly keeps both players engaged during the entire game. The system is simple to get into, has great replay value, and is on a topic that is rarely seen in the hobby. Despite the number of units on the board and the large amount of chits in the cup, the game plays faster than you would think. Cons: The chit pull mechanic will frustrate some gamers who are used to more traditional hex & counter games. The inability to seal off an obvious hole because all of a turn’s chits are drawn for formations nowhere near it could be frustrating for some gamers. Some reference cards and rule reminders would have been nice as well. There are several important rules buried in the text that are hard to remember and a few times I had to look through the rules several times to find them. I also think it’s a game that where you probably won’t play everything correctly the first time. If you like A Victory Lost and A Victory Denied, then you need to add this game to your collection. If you’re an East Front fan and are looking for something new other than invading Russia for the 100th time, then again, this is a game you should pick up. It is an interesting situation with numerous challenges for both sides. Hopefully, more games with this mechanic will appear. Excellent review Matt! This one’s a winner, especially good solitaire too. As to your wish for further titles using this game system, Revolution Games is planning a reissue of the original designer’s other East Front game, Army Group Narva. Same time frame, another desperation German defense this time on the Baltic front. Here’s hoping that all the good reviews of K1945 will drive enough sales to hurry that release along! Don't forget this gem derived from the same chit-pull activation system too. It simulates the command problem at a pace very much like WWI. The command problem which makes coordination at at corp/ division level difficult is something that reflected truly to its essence. The system is typically suited well to gaming a war at theatre level. I enjoy it very much. I have read the rulebook of Konigsberg and is beginning to look for a PBeM player. If anyone happens want to join, please geekmail me. The rule-books of AVL and AVD are clear, while this isn't.